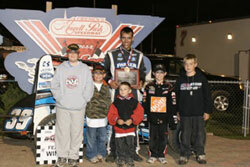 Bryan Clauson began racing at an early age. His hard work has been paying off. On Friday night Bryan Clauson of Noblesville, Indiana won the POWRI National Midget event at Morgan County Speedway - the next evening he took the checkered again at the annual Tom Knowles Memorial O'Reilly event at Spoon River Speedway. One week later, driving a Sprite car in a single race event called the Haubstadt Hustler 50, Clauson made it a neat three for three - collecting a juicy $10,000 check for that effort. Winning races is one thing, kicking the stuffing out of the competition by winning 15 overall events in a season (Sprint car and Midgets, dirt and pavement) is totally off the hook and nationally news worthy. Possessing mad natural skills is a solid foundation, but add to that a relentless work ethic and Yoda like, fatherly insights, and you've got the fertile environment that big-time champions sprout from. Tim Clauson (Bryan's father) is a nationally renowned driver talent scout; he has a well-documented knack for recognizing and honing the right stuff in racers. "Working with Bryan is a lot different than working with most drivers. Bryan and I have been together in a Crew Chief/Driver relationship since he was five years old and I first strapped him into a racecar (Quarter Midgets). I was able to teach him how I perceived he should approach driving racecars from day one. He learned things at a very early age that became habit behind the wheel," say's Tim. Bryan has been racing ever since, logging 15 years of experience behind the wheel already. Bryan was signed by Earnhardt-Ganassi in September of '05, the next year he won National Midget Rookie of the Year and a host of other accolades, adding additional confidence elements into the already frothy racing mix. Asked when he first sensed that Bryan had the chops to be a racer, Tim said, " two things stick out, the first was before he ever drove, at maybe four years old, he started correcting me behind the wheel. I knew then he had an eye for it and that he would be a student of the sport. The second thing was the first time he drove a sprint car, he was so smooth and his car control just stood out. He was 13 at this point and I figured I might be in trouble." Included in his benchmark racing season up to this point is winning three of the Crown Jewel Midget racing events - The USAC Midget Week Championship, The Hall of Fame Classic, and the granddaddy of them all, The Belleville Nationals. "Really, in the grand scheme of things, winning the POWRI midget events continues to validate Bryan as a student of the sport, as this was the first time for our team competing at both of these venues. Bryan spent a lot of time studying video before we competed. Habsdaudt was a little more personal. We've come up short there on a few occasions and that track is one of the higher profile racetracks here in Indiana." 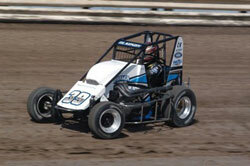 "We are currently using K&N Sprint car filters, oil filters, and K&N Midget Filters," adds Tim. "It's winning package and we're grateful for all the support, why mess with success?" What kind of advice does a driver talent scout, crew chief father, give to his phenom son before races? "I try to let him know what I am seeing as far as track conditions and where I have the car and what way to go as far as adjustments, if they are needed. I also tell him to be safe and just do what he does." 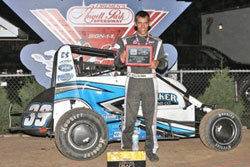 And, what Bryan Clauson does is win races. Keep an eye on this one.